A Ukrainian national suit is not only an article of clothes. It is a symbol of the nation. It is a kind of art and a national relic. It is a relic from our ancestors revived by the hands of craftsmen. It is Ukrainian people's pride. It is craftsmanship that has survived through years. The national garments present the Orthodox Ukraine. Also, they are a symbol of the nation, like its language, denominations and customs. The main feature of Ukraine's national clothes is the baroque style, which manifests itself in the exaggeration of general forms. Let us recall, let us say, the embroidered sleeves of a woman's shirt, the ornament of embroidery, laces, etc. Special decorative fabrics and different ribbons and threads of beads add festivity to garments. The most common women's piece of clothes - a long shirt belted at waist - has come to us from the ancient Slavic people. It is decorated by magic ornaments. At first, people used to wear long shirts, and later, skirts appeared in Ukraine, which had their own peculiarities in different years. 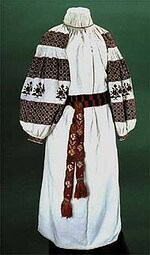 A wreath is one of the main elements of a Ukrainian national women's suit, as well as red boots. A wreath is a symbol of purity and youth. Also, it is an inseparable part of wedding garments. The wedding symbolic of a wreath is reflected in love magic and fortunetelling, in the custom of giving a girl a wreath on the engagement day, in the usage of a wreath at the wedding.